Benicar Weight Loss News : Have you taken Benicar (Olmesartan Medoxomil ) and experienced rapid, extreme weight loss? Benicar, a popular medication used to treat hypertension, can cause a chronic intestinal condition called sprue-like enteropathy, which is characterized by chronic diarrhea and severe weight loss. In July 2013, the U.S. Food Drug Administration (FDA) ordered the maker of Benicar and other brands of olmesartan to include new warnings about this risk on the drug’s labels. Alonso Krangle LLP is investigating Benicar weight loss, and is offering free Benicar weight loss lawsuit legal consultations to anyone who experienced extreme weight loss and other symptoms of sprue-like enteropathy while taking this medication. To learn more about your possible legal options including filing a Benicar weight loss lawsuit, please contact the lawyers at Alonso Krangle LLP today. Benicar, known generically as olmesartan, is an angiotensin II receptor blocker (ARB) to treat high blood pressure that may be used alone or with other drugs. According to the FDA, more than 10.6 million olmesartan prescriptions were dispensed to 1.9 million U.S. patients in 2012. 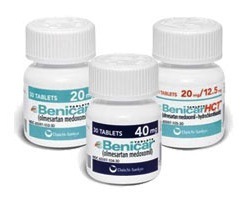 In addition to Benicar, olmesartan is sold under a number of brand names, including Benicar HCT, Azor, and Tribenzor. In recent years, mounting evidence has suggested that use of Benicar may put patients at risk for serious intestinal problems, including chronic diarrhea and extreme weight loss. In June 2012, researchers with the Mayo Clinic reported that symptoms of a celiac-like disease had been reported in 22 patients using olmesartan. In 14 of the patients, symptoms were severe enough to require hospitalization. However, none of these patients tested positive for antibodies that would indicate they were suffering from celiac disease, and therapy via a gluten-free diet did not improve their symptoms. In fact, improvement was only seen after the patients stopped taking Benicar. On July 3, 2013, the FDA warned that it had found “clear evidence of an association between olmesartan and sprue-like enteropathy.” In a Drug Safety Communication, the agency reported that it had identified 23 serious cases of chronic diarrhea, intestinal inflammation and severe weight loss among patients taking Benicar and other forms of olmesartan in its Adverse Events Database. Again, it was reported that the patients’ symptoms improved once they stopped taking Benicar. The FDA is now advising doctors to discontinue Benicar treatment in patients who experience extreme weight loss, chronic diarrhea, or other symptoms indicative of sprue-like enteropathy if no other cause for their problems is found. If you or someone you care about experienced extreme weight loss, chronic diarrhea, vomiting or other intestinal problems while taking Benicar, you may be eligible to file a Benicar extreme weight loss lawsuit against the maker of this blood pressure medication. To learn more about your possible legal options including filing a Benicar weight loss lawsuit, please contact the Benicar lawyers at Alonso Krangle LLP by filling out our online form or calling us.